The Swannies Classic Blue Light Blocking Glasses may supercharge your sleep and health by filtering and blocking harmful blue light from electronic devices while letting in all other safe light. Wearing the computer glasses at least an hour before bedtime leaves you free to watch TV and use devices without ruining your sleep. Wear when working on computers or gaming to stop sore eyes + headaches. Swannies Classic Blue Light Blocking Glasses may improve your sleep and health by filtering out harmful artificial light from digital devices. Wearing these US FDA-registered glasses at least an hour before bed allows you to use phones, tablets, computers and e-readers freely without disrupting your sleep. Swannies may also help prevent sore eyes, headaches, fatigue and blurred vision associated with digital eye strain. Experts are increasingly warning that poor sleep leads to obesity and poor general health. They say that sleep deprivation influences weight by increasing appetite and reducing levels of physical activity. Harvard researchers have even linked exposure to blue light at night to several types of cancer (breast, prostate) diabetes, heart disease and an increased risk of depression. Optometrists are predicting an epidemic of premature macular degeneration (vision loss) from prolonged exposure to digital devices. 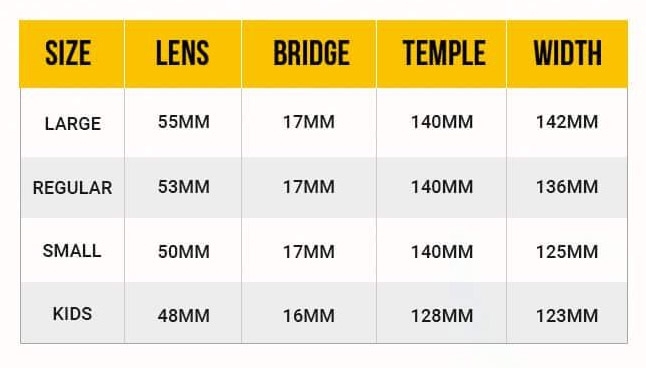 You're probably suffering from excess artificial light in the evening. Optometrists are predicting an epidemic of premature macular degeneration (vision loss) from prolonged exposure to digital devices. An overwhelming body of new medical research has found that this exposure to high energy blue light seriously disrupts your sleep. And long periods of time in front of electronic devices such smartphones, tablets, computers and televisions causes digital eye strain or computer vision syndrome. Shawn Stevenson, Author Of Amazon #1 Bestseller "Sleep Smarter"
"I love them. These are awesome!" Can I use these with contact lenses? 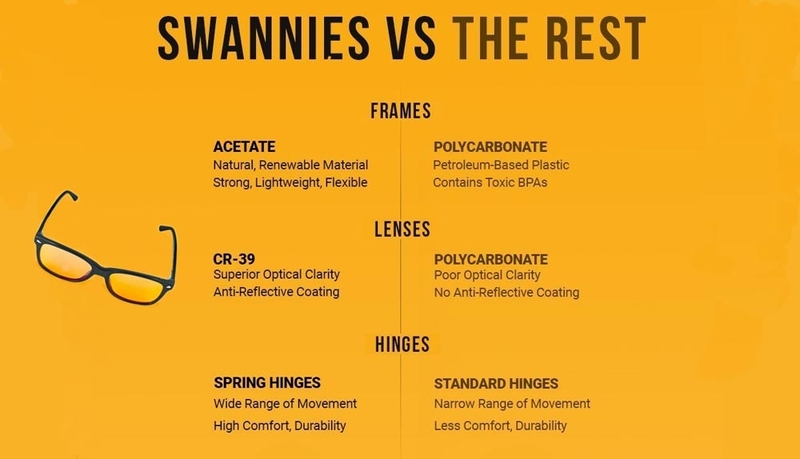 It is perfectly fine to use Swannies with your contact lenses. We also have a fitover version that can be worn over the top of your regular prescription glasses. Do these come with instructions about the best way to use them to get better quality sleep? 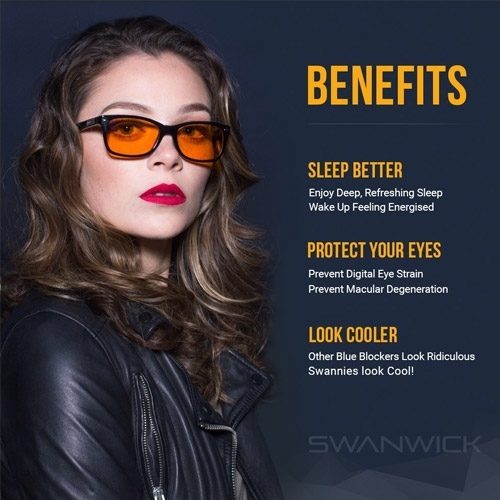 Swanwick recommend wearing Swannies Blue Light Blocking Glasses any time your are using digital devices such as phones, tablets, computers or TVs for extended periods. This may prevent digital eye strain. Swanwick strongly recommend wearing your Swannies at least one hour before bedtime to stop artificial blue light disrupting your sleep. Some customers report better results putting the glasses on even earlier before bed. 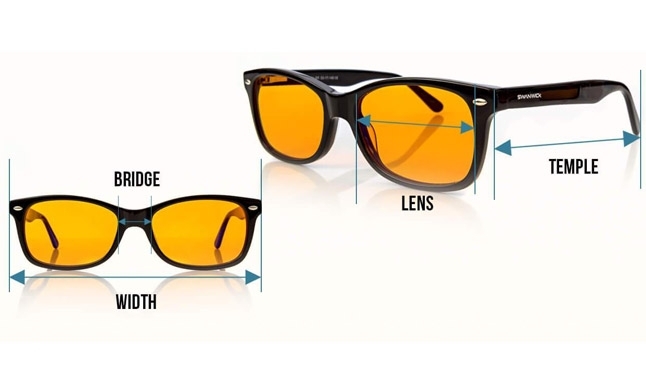 Can I wear these glasses over reading glasses? You could wear potentially wear them over reading glasses but it would not be ideal. Swanwick offer a fitover version if you have glasses. How do they work out using them during the day in sunny outside daylight? 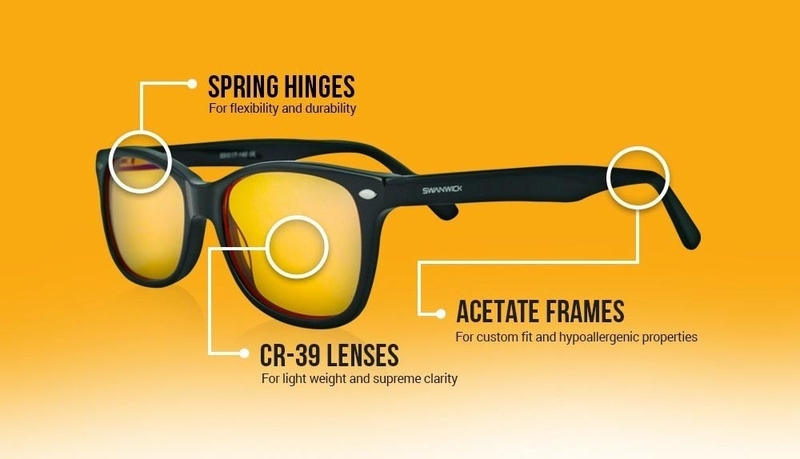 Swannies are 100% UV rated which means that you can wear them outside without any problems. However they are designed to be worn at night a few hours before going to bed.